Exploring the globe since 1888: A journey through time with the world s favorite magazine Limited edition of 125,000 copies worldwide For five generations, National Geographic magazine has dazzled and educated people with its incredible photographs, illustrations, and gripping stories from the four corners of the earth. Combining travel, wildlife, science, history, culture, and conservation, the National Geographic Society s trailblazing magazine has inspired millions of readers to explore and take an interest in the planet we inhabit. Now, in celebration of its 125th anniversary, National Geographic has given TASCHEN complete access to its archives to distill the journey of a lifetime into three prodigious volumes featuring photographs many unpublished almost as rich, deep, and colorful as the world itself. Our trans-continental trip starts in the Americas and Antarctica (Volume 1); we then cross the Atlantic to Europe and Africa (Volume 2); and finally sail the Indian Ocean to Asia and Oceania (Volume 3). From evocative early black-and-white pictures to autochromes, from the golden age of Kodachromes to digital, National Geographic invented the aesthetic of the photo essay, while pushing the technical boundaries of the medium. Readers will discover how the magazine evolved from presenting a romantic view of the world subjects posed and smiling to edgier stories reflecting political turmoil, social issues, and environmental threats. Of course, the journey would not be complete without prime examples of the magazine s revered groundbreaking underwater and wildlife photography, so we ve included plenty of such treasures as well. This world class set is a cultural investment to be cherished, shared, and passed down to future generations. 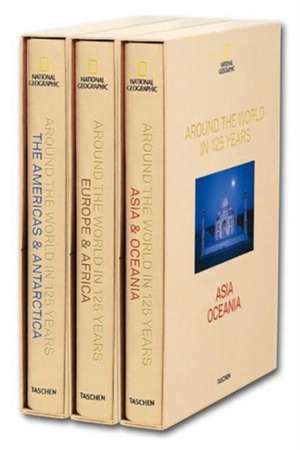 Features: 1,404 pages of photos in three volumes Includes photos by Steve McCurry, Frans Lanting, George Rodger, James Nachtwey, and dozens of National Geographic staffers who covered the worldfrom Timbuktu to Tuvalu Introductory essays by Douglas Brinkley Photographer biographies Each slipscase converts into its own bookstand because these treasures deserve to be put on display "
Reuel Golden: graduated in politics from the University of Sussex, England, and is the former editor of the British Journal of Photography and executive editor at Photo District News. He has edited on titles including both New York, and London, Portrait of a City, Her Majesty, and Harry Benson. The Beatles.